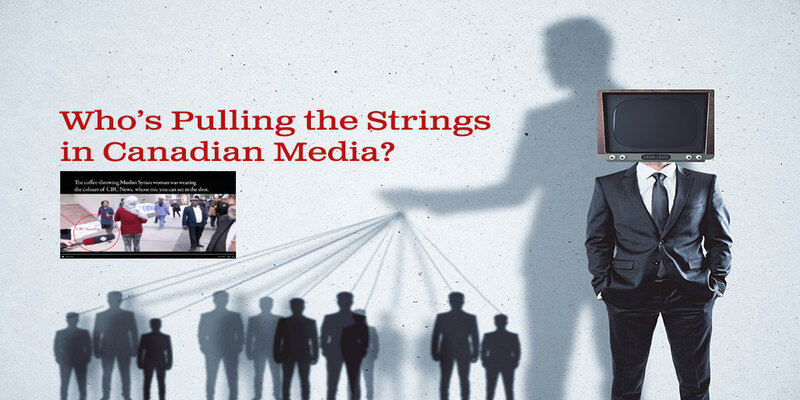 Who’s Pulling the Islamic Media Strings in Canada? PM Trudeau and Canadian media have apparently so emboldened Muslims that they now feel free to walk up and assault people on national television. *Update 09-25-18. In an interview, the target of the assault Laura-Lynn Thompson indicated the assaulter’s identity remains unknown. 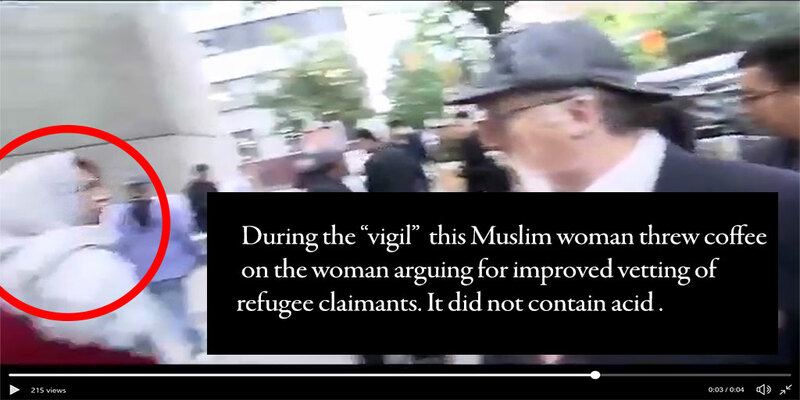 Regarding what is by all appearances a hijab wearing Muslim woman in the video, Thompson said that in that brief second she could see the assaulter was also “dark complexioned”, but she couldn’t testify that the assaulter was a woman, nor a Muslim, nor one of the Syrian Muslims in attendance. The media’s failure to cover the assault was amplified by Thompson revealing that she believes the assaulter said something during the assault; however, the audio has been oddly removed from the video. The Canadian media literally have the back of a hijab wearing Muslim woman* who assaulted people in broad daylight, in downtown Vancouver, on national television. The people she assaulted apparently said something she didn’t like, something to do with increased vetting of migrants, so she threw coffee on them. It was a chilling scene in the 21st century where most acid attacks occur in Muslim countries, even according to this Muslim Huffington Post article. Canadian media coverage have shown their true colours in this incident. None of the media have even shown the back of the hijab wearing woman walking away, must less her side profile which can be seen in a still frame. 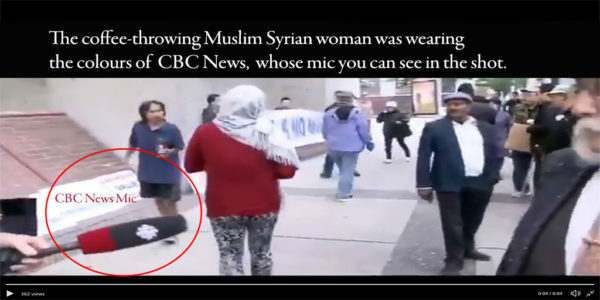 It’s so odd that the Muslim woman is dressed in the exact colours of CBC News, making it a colour coordinated media event. 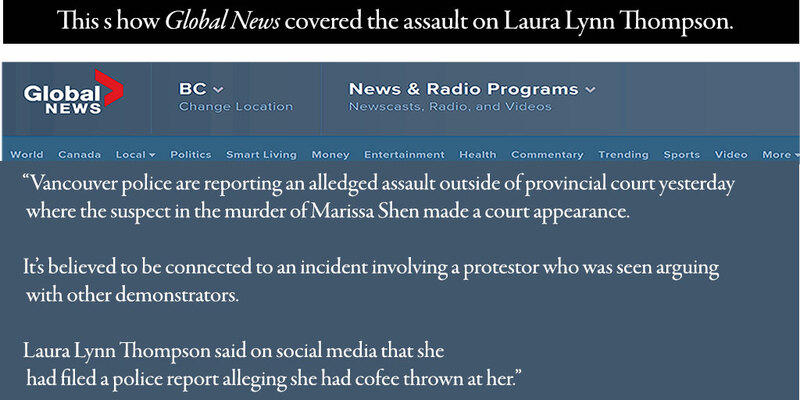 Other media like Global News made mention of the incident, but in veiled terms, never stating that an assault occured, much less show the image of the assaulter they all had access to on video. Here are videos of the national media recording the whole incident. First, here is the woman, Laura Lynn Thompson who appears to be the primary target of the assault, exercising her free speech being recorded by national media. Here is the assault on Thompson, and other Chinese people including a Chinese reporter who may also be pressing charges (out of shot) in this video. My video summary of the events up to Sept 14, 2018 is below, as well as a textual re-cap. 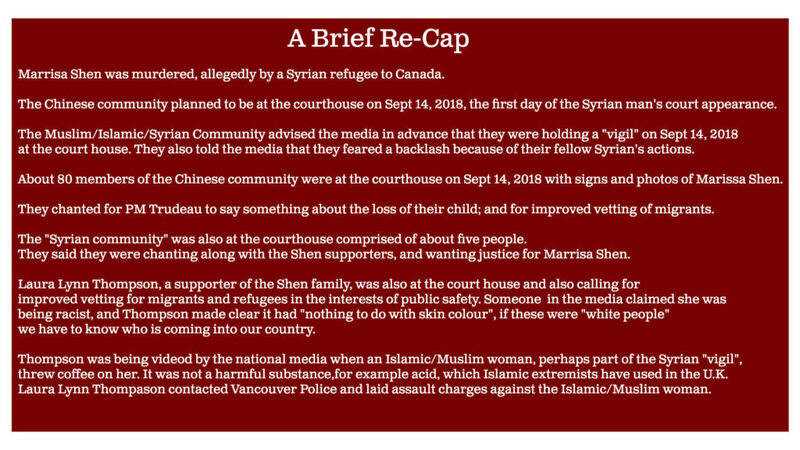 Here is how CBC, CTV and Global News media fairly consistently reported what happened at the British Columbia Provincial Court House earlier that day. Images of the Islamic/Muslim/Syrian community holding a “vigil” were shown, and they were portrayed as being “fearful” of a backlash because of their fellow Syrians’ actions. The Vancouver Sun was an exception; however, it portrayed Thompson as “anti-immigration” and used a photo of Thompson wiping coffee off of herself, making her appear angry. No one in the media provided the image of the Islamic/Muslim, coffee-throwing woman, of which there was an abundance from their video and many smart phone video recordings. 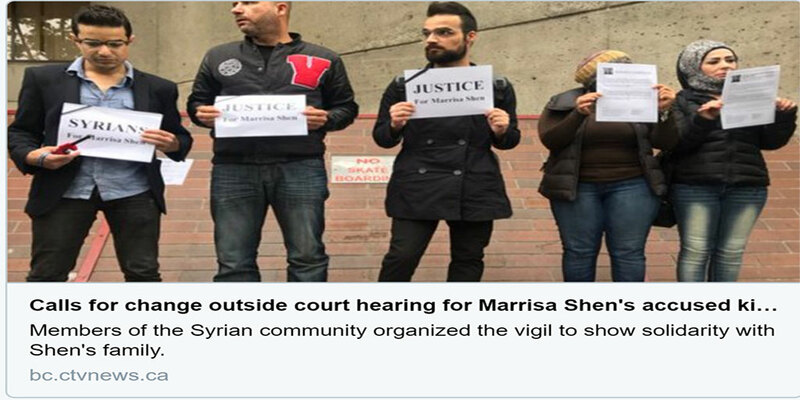 CTV News continued to depict the Syrian Muslims as candle-holding victims of backlash, and continued their refusal to report the hijab wearing Muslim woman as a coffee-throwing assaulter of Thompson and others. CTV did however, quote comments by Thompson about improved vetting for migrants and refugees. Global News did comment on the assault, but falsely implied that Thompson had been disruptive. Perhaps most shocking, Thompson said today that she was advised PM Trudeau intervened to ensure news media cannot be compelled to provide video to police. Did PM Trudeau “pull some strings” to protect the hijab wearing Muslim assaulter? The Trudeau Liberal protection of Islamic extremists and activists that seek to change Canada by bringing Sharia Law and tactics to our shores must be confronted in honest and open dialogue. They are not welcome. The many Syrian migrants who have come to Canada as legal migrants because they want to be Canadians, and live in a Western democracy are welcome. They are cherished and productive members of our Canadian society. The Trudeau Liberals are harming everyone. Global News is now covering this incident but referred to the “hijab” as a scarf and did not include the image of the Muslim woman. I wonder if any news organization would refer to Linda Sarsour’s hijab as merely a “head scarf”. Police said the suspect is described as Asian, in his 20s, with a medium build, between five feet eight inches to six feet tall, with a moustache and black hair. He was last seen wearing glasses, a black hoodie, brown gloves and black pants. He was holding scissors with blue handles. Again, the hijab cutting incident as alleged by the Muslim girl was proven to be fake. It also seems unusual that if the VPD is looking for the hijab wearing woman and/or witnesses to her throwing the coffee/liquid, wouldn’t the VPD be asking news media to show the image of the hijab wearing woman so that people can identify her and/or re-call the incident as first-hand witnesses. But then, CBC News may be unwilling to let anyone use their video for this purpose per PM Trudeau’s directives. At least Global News is now covering it: better late than never. This entry was posted in Islamic Activism, Sharia Law in Canada, Liberalism-Socialism-Communism, Mainstream Media, Think Over News, Videos and tagged assault, canadian media, islam, laura lynn thonmpson, marrisa shen, muslims, police investigation, syrian community, trudea.